So, for example, let's say you were born in the mid-1930s. Your mother had been baking these Crumb Wafers from a cookbook she had acquired before you were born. 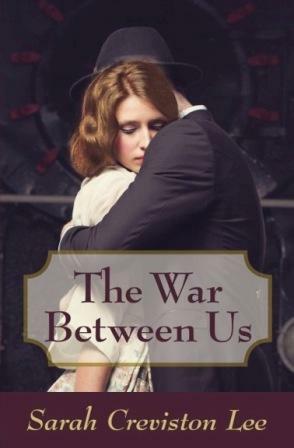 Then along comes WWII. People didn't necessarily stop making all the foods they made before. 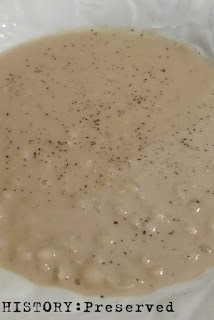 Of course they tried new recipes and time-saving techniques in the kitchen, but no doubt they also adapted recipes they loved and enjoyed for rationing or continued to use recipes that worked well with rationing conditions. And that was my whole point for choosing this recipe for Crumb Wafers this week. 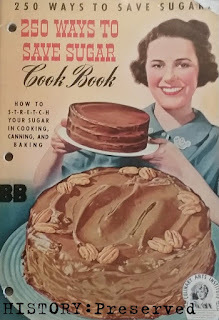 The recipe is circa approximately 1930 (judging by what the women are wearing and their hairstyles pictured in the cookbook), and yet it fits really well into the rationing era of WWII. I really like this cookbook. It was a rare antique shop find and I felt very fortunate to stumble upon it. "These recipes take the CUSS out of custards!" haha! "Sauces made in a twinkling!" "Who said ice box cakes are hard to make?" I don't know! "Cakes and cookies that almost make themselves!" "Beverage secrets that save you time, or trouble, or money... or all three!" What a relief! Haha! 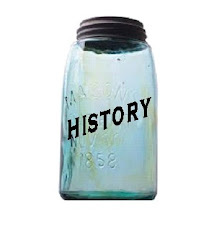 Isn't history so much fun? 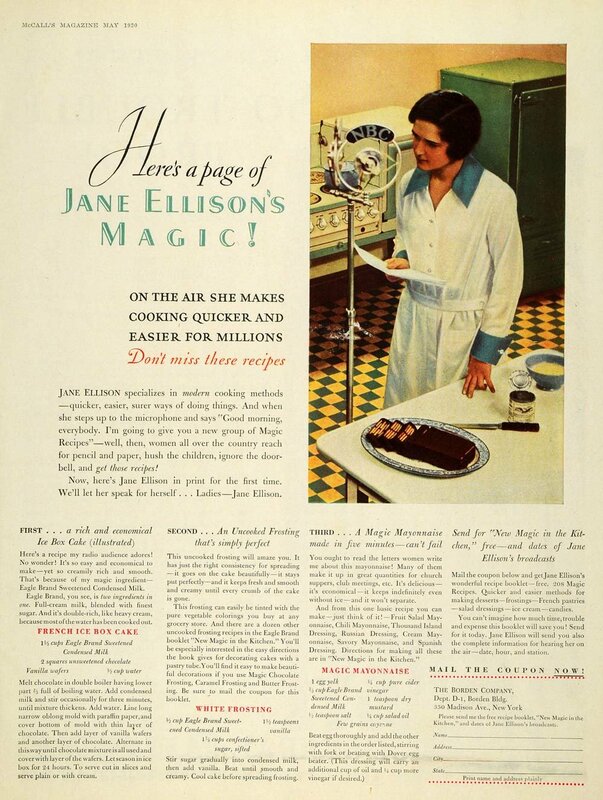 The cookbook also makes reference to a woman named Jane Ellison who gave frequent morning radio broadcasts in the 1930s featuring "Magic Recipes". It appears she was a representative of Borden as she promotes their product at the back of my cookbook with some helpful advice. I do believe the advertisement below is for my very own cookbook - "Magic in the Kitchen". Haha! I just find it perfectly thrilling when I find these little matches of ad & booklet! A really cool thing about it is that it only has four ingredients! Isn't simplicity just lovely? Nutmeats can be used to replace the coconut. Combine the sweetened condensed milk, graham cracker crumbs, and shredded coconut. Whip up egg whites to stiff peaks. And then "fold" the egg whites into the batter - easier said than done! The batter was really thick and sticky which isn't very conducive to gently folding in egg whites. It took awhile with a bit of spoon jabbing, but I got the job done! The dough is very thin after folding in egg whites. The recipe says to spoon the dough onto wax paper, but I used parchment paper. The wafers spread out a bit. The recipe says it makes 2 dozen cookies. These cookies were... interesting. You bite into one and the flavor gets you thinking about coconut macaroons (which is what they are essentially), but the texture is much softer and a bit bready in a way - not crunchy and chewy like you'd expect. They weren't my family's favorite, but the flavor is very pleasant with the subtle graham cracker flavor mixing with the coconut. The texture is just something to get used to. My husband thought the texture reminded him of pumpkin cookies. They are very sturdy too, so shipping them overseas could have been a good option for these little guys. To be honest, you might want to skip the egg whites and even the baking and just eat the dough! The dough was seriously good. I'm happy I tried the recipe. It was unlike any cookie recipe I had ever seen!